Career Advice / Paying for Education / How much does it cost to study in Canada? If you’re a student who’s cast a national net for your post-secondary institution of choice, there’s good news and bad news when it comes to your housing and tuition costs. Let’s start with the good news: There’s some great schools in cities across Canada that have an affordable cost of living, such as Ottawa and Montreal. But if you’re looking at Vancouver, you’re going to need a lot more than an umbrella fund, and to no one’s surprise, going to school in the nation’s largest city is going to require a big housing budget, especially if you want to live anywhere close to downtown Toronto. Although housing costs are a big consideration when opting to leave home for your post-secondary education, your tuition will vary too, depending on your destination province. And if you’re coming from abroad, your tuition as an international student will be vastly higher too. As university and college acceptance letters will soon be rolling in, Course Compare teamed up with real estate listings website Zoocasa to paint a more complete picture of how much it really costs you to move away to go to school. What numbers did we crunch? The financial numbers we looked at considered both the actual schooling costs as well as the money needed to live—and even enjoy—the city. Second, we assumed you’re not living on campus residence or freeloading off family and factored in the following costs: monthly transportation, monthly gym membership, a meal out for two, and most importantly, the cost to put a roof over your head. If we assume you’re going to be living alone in a bachelor apartment, you’re in luck. Four of the six cities on the list are reasonable when it comes to rent. Housing costs in Calgary Edmonton, Montreal and Ottawa are all affordable, with a bachelor apartment renting for less than $1,000 a month. It’s the tuition that varies a little more widely, with Montreal’s Canadian undergraduate costs starting just shy of $3,000. Calgary and Edmonton fall into the middle at just under $5,400 while Ottawa schools are steeper, starting at just under $8,000. It’s the only city that sees a spike with graduate tuition, which breaks the $10K threshold. Montreal, which is home to both McGill and Concordia, is the real winner in terms of costs, so if you want to live in a city that remembers its European roots while offering great bagels and smoked meat, your average monthly rent will be less than $650. Dining out and transportation is a little cheaper too. If you want to go west, but not all the way to the West Coast, Edmonton and Calgary are nearly identical when it comes to your monthly costs, with a bachelor apartment renting for just under $900.00 a month. Dinner for two is costlier in these cities than in Montreal, as is transportation. Ottawa, meanwhile, is also affordable despite the higher schooling costs relative to Edmonton and Calgary, with a bachelor still coming in at under $900, while transportation and dinner for two will cost more here than in Alberta’s major cities. Ottawa does have the advantage of being the nation’s capital, however, so there’s some great cultural events and facilities, including the world’s longest outdoor skating rink, and if you opt to attend the University of Ottawa and live downtown, you’ll be able to walk just about everywhere. That Vancouver and Toronto are expensive cities to live in will probably not come as a shock. 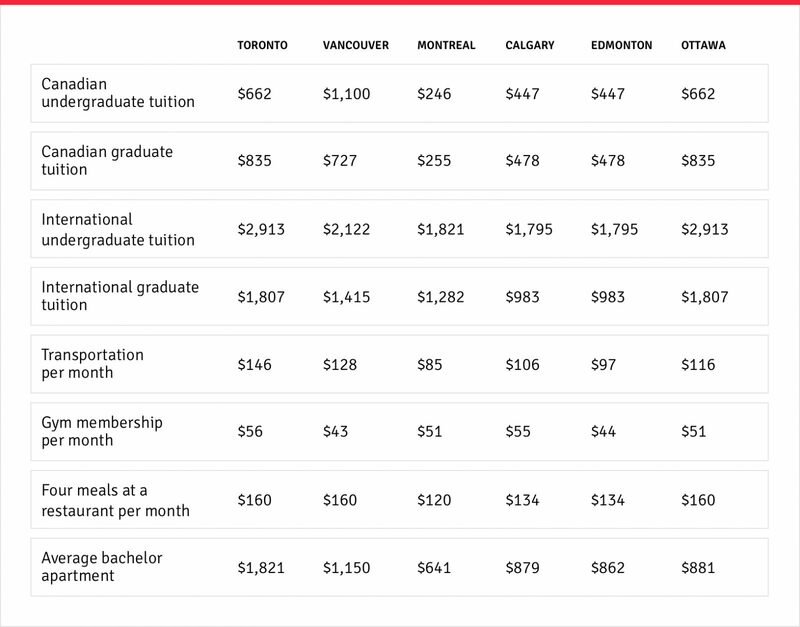 And the tuition for a Canadian undergraduate student isn’t significantly higher with Toronto on par with Ottawa, and average tuition in Vancouver in line with tuition in Calgary and Edmonton. It’s the housing costs that are going to eat away at your budget, as well as the overall cost of living, thanks to the low vacancy rate in both those cities. The average bachelor in both cities breaks the $1,000 threshold, according to the CMHC (Canada Housing and Mortgage Corporation), and that might be a little conservative, especially given that you may want to live downtown. A Simon Fraser University student living close to Burnaby mountain may pay a little less than someone who’s living downtown or closer to UBC’s campus in the west end. Your meal, transportation and gym costs are all inching up—and don’t forget you’ll need to budget for those umbrellas. Toronto presents the biggest challenge in terms of housing costs, so much so we thought it important to get a second opinion given upward pressures in this market, as well as the differences in downtown living costs as compared with more suburban areas, where some schools are located. And that’s where the sticker shock comes in. There can be a big difference between living in the City of Toronto versus the Greater Toronto Area. Although the CMHC data suggests a bachelor apartment is not that much more expensive in Toronto than in other major cities, the Toronto Real Estate Board estimates the average rent in downtown Toronto is $1,838, and a one-bedroom is $2,196. Bear in mind that these numbers factor in condo owners renting out their suites, which can push the numbers up, but purpose-built rentals are still pricey given the city’s low vacancy rate. If you go further west, east or north, you may save some money on housing, although you won’t be walking everywhere. Once you factor in your tuition costs, where you hang your hat is going to be the biggest financial consideration when it comes to picking your future alma mater. And these numbers just scratch the surface in terms of monthly costs. None of that’s to say housing costs should dissuade you from getting the best possible education. There are, of course, intangibles that might make a school or program right for you. Just be sure you know what you’re enrolling in, and make sure it justifies a higher cost of living–and promises a better long term return on your investment. This report was compiled in partnership with Zoocasa.com, a real estate company that combines online search tools and a full-service brokerage to let Canadians purchase or sell their homes faster, easier and more successfully. Home buyers and sellers can browse listings in a number of markets across Canada including Toronto, Vancouver, and MLS Ottawa listings, as well as Calgary real estate and MLS Edmonton listings on the site, or with the free iOs app.